Alli, YetAnotherGirl, Molly W., and Laurence D. all sent in links (via The Mary Sue and Feminist Law Professors) to a post at The Achilles Effect on gendered language in children’s toy commercials. 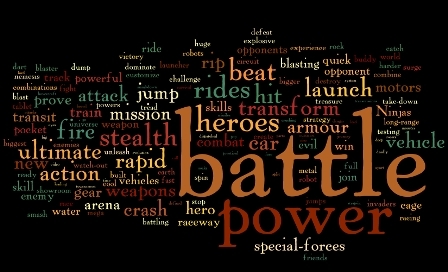 Crystal Smith created word clouds based on 658 words in 27 TV commercials generally aimed at boys (products included “Hot Wheels, Matchbox, Kung Zhu, Nerf, Transformers, Beyblades, and Bakugan”) and 432 words from 32 TV commercials generally aimed at girls (products: “Zhu Zhu Pets, Zhu Zhu Babies, Bratz Dolls, Barbie, Moxie Girls, Easy Bake Ovens, Monster High Dolls, My Little Pony, Littlest Pet Shop, Polly Pocket, and FURREAL Friends”). This clearly isn’t a random sample of all toy commercials on all TV channels to all age groups; as Smith points out, it ignores toy companies that can’t afford TV ads, and it’s not a huge sample. 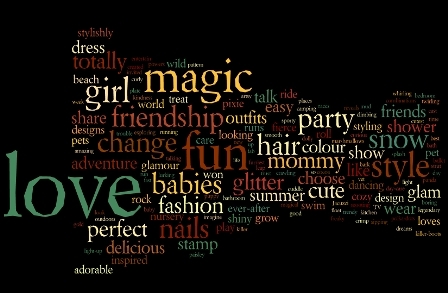 However, given that these are popular toys that were being marketed during shows (such as cartoons) that are aimed at children, the word clouds provide a basic overview of gendered language in toy ads. You can see larger versions at Wordle (girls and boys) and Smith says she has a reference list of all the commercials she a reference list of all the commercials available, which I requested. I’ll update the post with the list when I get it. UPDATE: In response to my email, Crystal Smith cautioned, “This is a very small sample of brands that tend to appear frequently during kids’ cartoon blocks on TV. They are highly gendered toys, which explains the incredible contrast between the two lists.” She sent along the references; the girls’ list is available here, the boys’ list here. This is fabulous!! I do a toy analysis in a teacher training I do on transgender elementary school students. This will be a really useful addition to that. Thank you! This makes me want to go through both lists and create an ideal one. What a world we'd live in if every toy commercial contained the words "love" and "power." Also interesting is how the "boy" toys are mostly vehicles or some kind of beast-gizmo, while the "girl" toys are mostly representations of humans or a cuddly animal. There's a noticeable "boys = mechanical, girls = natural" trend going on. I find it interesting that "fun" is fairly large on the girls side and not present on the boys side at all. Well, this looks like it would be an excellent model for an alternative course assignment -- give students the program to generate word clouds, send them out to investigate some discourse -- any discourse, really -- and they get a nice visual as the basis of a very short write up and presentation/poster session. Nice break from research papers, but based on their own original research. I see a lot of possibilities! I love the wordle trend being applied to sociological dissection of gendered TV ads instead of just cheap marketing campaigns. I wonder what the word clouds would look like if we input larger sets of readily available data, such as that from studies that show parents' language differs when describing and talking to female children vs. male children. Come to think of it, I'd love to dump some data into a wordle from my everyday conversations with different folks and see what happens. I'm not about to argue that there ISN'T a divide. I'm sure you'd probably only see boys in the commercials for, according to Wordle, "toys like Hot Wheels, Matchbox, Nerf, Bakugan, Beyblades, and Kung Zhu" and girls in those for "Barbie, Bratz Dolls, My Little Pony, Littlest Pet Shop, Zhu Zhu Pets, Polly Pocket, Easy Bake, Monster High, and Moxie Girls", but surely the issue is branding these things as girls' toys and boys' toys, not the words used to describe them? All it's saying here is that active, confrontational toys get marketed with active, confrontational language and vice versa. This would still be true even if there weren't a gender divide in the expected recipients. Then again, perhaps there should be a BATTLE POWER Barbie. My daughter would have loved a Battle Power Barbie. My son would have loved Zhu Zhu pets. In fact, a lot of little boys liked the pet toys (and stuffed animals) when my kids were little; when did they become girls only? This just totally makes the proposal that bronies exist due to the complete forbidden nature of the feminine. This also explains why some adolescent and adult females watch as well: we're indulging too. Anyways, nothing necessarily bad about any of the words. The problem is that love and battle cannot appear side by side. The grouping of the words together with gender is the problem. wow.. i just wasted 3 minutes of my life. Why would i care if there are different words in commercials for girls and boys. DUH. they are COMPLETELY different. Girls like playing with dolls and barbies and cooking stuff and boys like raw power and battling people. Somebody posted a link to this blog on a forum I frequent. Could you shed any light on how the words that appear in the cloud were selected? It's obviously a term extraction of some kind, and I suspect you're using TF/IDF, because very common words like "the" and "and" and "or" don't appear on either list. I also notice they're not stemmed, eg if you have "nails" on the girl list, that implies that "nails" and "nail" are treated as two different words. Further, the boy list has "special-forces," which makes me wonder whether you're collecting n-grams but it's mostly single words that float to the top, or if dashes aren't being treated as word boundaries? Finally, most of these terms are nouns, but not all. I'm asking because I'm interested in textual analysis in general, and in how people are using term extractions to summarize documents in particular. This seems like a great "in the wild" example, and I'm curious about how you made it? I would BATTLE my enemies to rescue the princess that I LOVE. Simple right? It was interesting to see how big of a difference each word box was. However, media has done this for years now and it's upsetting to see that not much has changed. Boys and girls should just be able to choose what they want to play with rather than be told otherwise.